John Stanifer has read 35 of 100 books. John Stanifer read 102 books of his goal of 100! John Stanifer hasn't written any blog posts yet. I've been meaning to read this classic biography of Tolkien for years. I started it over a decade ago and got distracted (no fault of the author--this is extremely readable). This time, I was determined to have read it before going to see the movie T I've been meaning to read this classic biography of Tolkien for years. I started it over a decade ago and got distracted (no fault of the author--this is extremely readable). This time, I was determined to have read it before going to see the movie TOLKIEN; whether or not that film turns out to be true to his life, I wanted to be well-informed. If you want to get a sense of Tolkien the man and a pretty thorough outline of the events of his life, it's hard to imagine anyone doing a much better job or having access to more reliable sources. 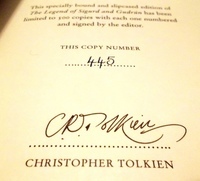 This, the first authorized biography, was a project that brought Carpenter into close contact with the four Tolkien children and allowed him to interview friends, family, and other associates of the author. I loved it. It definitely shows Tolkien as a human being with strengths and weaknesses and helps us appreciate what it took to bring one of the most popular works of literature of the 20th century to the printed page. Honestly . . . if you're mad about the never-ending wait for the next installments in A Song of Ice and Fire and the Kingkiller Chronicle, try to imagine what it was like for the first readers of The Hobbit to wait 17 years (!) for The Fellowship of the Ring. Not quite the same, maybe, since they didn't have a cliffhanger to deal with or the chaos of social media to stir up emotions, but still. I think one of the things that will stick with me the most from this biography is the description of Tolkien's procrastination and his tendency to get sidetracked by the minutiae of his mythology while publishers (and readers) were waiting, sometimes impatiently, for their fix. Given how much worse the ways for readers to harass and/or pressure authors have gotten in the last few decades, one wonders what Tolkien would think of the state of celebrity author culture and fandom today (yikes!). Anyway . . . this is a must-read for any fan of Tolkien's work who wants to know about the man, his life and process. We’d love your help. Let us know what’s wrong with this preview of J.R.R. Tolkien by Humphrey Carpenter. A shorter book, but full of interesting details about the attempts to rebuild Solomon's temple. There are also hints about the foreign dynasties and cultures that ruled Israel and Judah during the exile. "K A shorter book, but full of interesting details about the attempts to rebuild Solomon's temple. There are also hints about the foreign dynasties and cultures that ruled Israel and Judah during the exile. So basically . . . we're seeing something like an interlibrary loan taking place in the ancient world? Looking at where Babylon was located in relation to Ecbatana, it would appear Ecbatana was some distance away. In other words, the librarians and their couriers had to put in some overtime to find that scroll. This time around, I "read" VDT through Sir Derek Jacobi's audio rendition. His narration is, as expected, wonderful, and I don't know why it took me so long to get around to listening to it. The best part is probably his Reepicheep. His Reep always ma This time around, I "read" VDT through Sir Derek Jacobi's audio rendition. His narration is, as expected, wonderful, and I don't know why it took me so long to get around to listening to it. The best part is probably his Reepicheep. His Reep always makes me want to laugh, in a good way. We’d love your help. Let us know what’s wrong with this preview of The Voyage of the Dawn Treader by C.S. Lewis. Although there are still episodes that overlap with the books of Samuel and Kings, this is a FAR more interesting read than 1 Chronicles (due in part to the lack of the exhausting genealogies). It's always fascinating (if a little morbid) to read abou Although there are still episodes that overlap with the books of Samuel and Kings, this is a FAR more interesting read than 1 Chronicles (due in part to the lack of the exhausting genealogies). It's always fascinating (if a little morbid) to read about how much Israel and Judah swung back and forth between idol worship and Yahweh worship depending on who was ruling at the time. It may not have been COMPLETELY the king's fault (or merit) that decided whether people would follow God or not, but it sure seems to have made a difference.
" I'm reading his Tolkien bio at the moment in preparation for the movie next month . . ! "